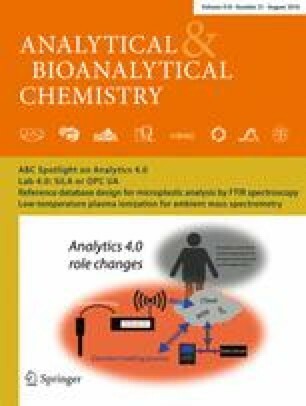 A new molecularly imprinted polymer electrochemiluminescence (ECL) sensor was developed for the detection of clopyralid (CPD) based on enzyme-biocatalyzed amplification. CdTe quantum dots were immobilized on the surface of an electrode by reaction with p-aminothiophenol preadsorbed on the electrode. Then a molecularly imprinted film was formed by electrochemical polymerization of o-phenylenediamine in the presence of CPD on the CdTe-modified gold electrode. During the analytical cycle, horseradish peroxidase (HRP)-labeled CPD was replaced by CPD in the sample. The amount of HRP on the molecularly imprinted polymer electrode decreased, and then less H2O2 was catalytically decomposed. Subsequently, the ECL intensity of the CdTe–H2O2 system was enhanced. There was a good linear relationship between ECL intensity and the concentration of CPD in the range from 2.0 × 10-11 to 2.5 × 10-10 mol/L and in the range from 2.5 × 10-10 to 3.5 × 10-8 mol/L. The detection limit was 4.1 × 10-12 mol/L. The sensor was applied to determine CPD in vegetable samples. The online version of this article ( https://doi.org/10.1007/s00216-018-1170-z) contains supplementary material, which is available to authorized users. We gratefully acknowledge the financial support from the National Natural Science Foundation of China (nos 21765006 and 21375031), the Natural Science Foundation of Guangxi Province of China (no. 2015GXNSFFA139005), and the High Level Innovation Teams of Guangxi Colleges & Universities and Outstanding Scholars Program (Guijiaoren49). This work did not involve studies on animals or humans.